In my case, the answer to that question was “a lot.” Thanks to regular acupuncture sessions, I’ve experienced significant pain relief and restored flexibility in my neck. I can turn my head while driving to see if it’s safe to switch lanes without having to rotate my entire body – a potentially life-saving capability. So how does this 3,500-year-old Eastern medicine work? “Magic,” smiled Dr. Xiping Zhou (pronounced “joe”), a peripatetic man who almost always radiates a warm, reassuring smile and an unmistakable aura of wisdom. But before we get to Zhou, I’ll tell you how I wound up in his tranquil, feng-shui perfect, spa-like Shorewood clinic. At 62, I have degenerative disk disease in my cervical spine and osteoarthritis that’s progressed to what’s termed “end-stage” in my left shoulder. I won’t go on about this – I’m not one to complain – but suffice it to say these conditions can be as crippling as they sound. The symptoms of my spinal condition include a very stiff, achy neck and shoulders along with radiating nerve pain (known as radiculopathy) down my arms and in my hands. Sometimes the muscles in my upper arms and shoulders twitch and jump around for hours, and sometimes my left index finger feels as if I’ve stuck it into an electrical socket. For several years, I’ve kept my problem more or less under control through epidural injections of cortisone in my neck. Unfortunately, epidurals can prove less effective over time, particularly when used frequently to battle a degenerating condition. “You have no idea,” I replied. The doctor called his office and booked me an appointment. “I’ll show you, OK?” he smiled. I was impressed with his confidence. That confidence is rooted in 3,500 to 5,000 years of Chinese medicine and the thousands of patients he’s served. Zhou, who’s a licensed M.D. (neurologist) in China, has practiced acupuncture and related therapies, including acupressure massage, cupping and herbal supplementation, for more than 30 years. In 1999, he became the first acupuncturist in the state to work in a Western hospital (Columbia St. Mary’s). In addition to his relatively new clinic in Shorewood, he also has a popular clinic in Madison. Zhou also is a venerated educator in his discipline. In 2000, he founded the East-West Healing Arts Institute and in 2008 he started the nonprofit Madison Community Wellness Clinic to expand access to alternative health care to people with limited incomes. Acupuncture is complicated to explain, but it’s based on using hair-thin needles to stimulate specific points on the body that can trigger biochemical and physiological conditions. Eastern medicine contends those points are located along channels of energy known as meridians that connect major organs. According to Chinese medical theory, illness arises when the cyclical flow of the body’s energy, known as “Qi,” becomes unbalanced or blocked as it moves through the meridians or connecting channels. Western medicine contends that inserting the tiny needles into acupuncture points stimulates nerves that transmit electrical impulses to the hypothalamic-pituitary system, which releases neurotransmitters and endorphins. Those are the body’s natural pain-killing hormones. In fact, endorphins are said to be 200 times more potent than morphine. Research has shown acupuncture reduces nausea and vomiting after surgery and chemotherapy, relieves arthritic pain, reduces symptoms of seasonal allergies and benefits many other conditions and complaints as well. There are acupuncture protocols for addressing a broad range of conditions. The World Health Organization recognizes acupuncture for more than 50 health conditions, including stress. The National Institutes of Health reports successful use of acupuncture for a long list of ailments, and the U.S. Air Force treats everything from battlefield wounds to post-traumatic stress disorder with acupuncture. 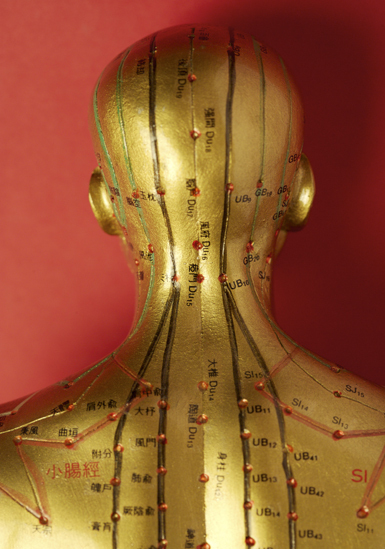 Zhou believes combining acupuncture and other Eastern healing arts and herbal remedies with Western medicine is the most effective approach for a range of problems, from arthritis to fibromyalgia, anxiety to addiction, obesity to infertility. In fact, there’s very little that traditional Chinese medicine can’t help or cure, according to its adherents. During my first session at Zhou’s clinic, I lay there on my stomach thinking of all the work sitting on my desk and nervously shaking my feet. The time seemed to go on forever. When the needles, which are no thicker than a hair and nearly painless, finally were removed, a massage therapist came in to knead and stretch me. Finally, the doctor himself showed up for a brief round of pummeling. When I finally stood up – man, what a surprise. My head had not sat so upright on my shoulders in years. I slowly tested my neck, cautiously rotating to the left and then to the right. It moved! “Lift your arm up,” Zhou said, pointing to my left arm, which normally moves no higher than Sen. John McCain’s. “You’ve got to be kidding,” I thought. But to my amazement, I stretched it all the way above my head with only medium pain. My head felt light, as new visions of me in motion raced through my brain. I dreamily imagined my hand exploring the upper reaches of my kitchen cabinet – a place that hasn’t seen visitors in years. What molded treasures might I find? When I suggested writing a story about acupuncture, focusing on my experience, Zhou began introducing me to other patients. Each one had a different story but they all ended happily. Patients uniformly voiced respect and gratitude for Zhou. Sarah Bernhard, 65, a retired principal, sought out Zhou’s services after having successful knee replacement surgery. Despite the new knee, the tendons and ligaments in her leg were so sore that she had a hard time climbing stairs. According to Bernhard, Zhou helped her with that and more. After going to the Shorewood clinic twice weekly, she was able to return to gardening and found herself practically bounding up stairs, Bernhard said. Zhou also helped Bernhard with weight control by reducing her appetite through needles placed mid-abdomen, she said. “I’ve always had sinus issues too,” she added. “I don’t know what he’s doing with that. But my sinuses are better. One of the more unexpected applications of acupuncture is to combat addictions, including smoking, drugs and alcohol. Zhou introduced me to a 23-year-old suburban woman who’s using acupuncture as part of her recovery program from an opiate addiction. The young woman (who asked to be identified only as Sarah) had stopped using drugs two years before she started seeing Zhou. She was experiencing anxiety, depression and restless leg syndrome. At first Sarah was given a generic medication for the restless-leg problem. She was prescribed anti-anxiety meds but declined because they have the potential to become addictive. “My problem was drugs, so I didn’t want to take them,” Sarah said. At first, Zhou focused on Sarah’s restless-leg problem. Zhou said he stimulates Sarah’s vagus nerve, which “stimulates the parasympathetic nervous system to make the body feel better – to make her relax.” Among other things, stimulating the nerve releases more of the neurotransmitter serotonin. As with most acupuncture treatments, the way of achieving this effect seems counterintuitive to the Western mind. Zhou focuses on an acupuncture point on Sarah’s outer wrist. An hour of stimulating this point – known as No. 7 – significantly relaxes Sarah’s body. Unfortunately, that’s exactly the way that many Western medical professionals treat acupuncture. Skeptics dispute research proving its effectiveness. They and competing wealthy interests have succeeded in keeping Medicare from covering acupuncture in Wisconsin and other states. In addition, it is not covered under the Affordable Care Act, and private insurers rarely reimburse for it.